SCHOOL OVERVIEW – In 1967 new school boundaries were established and a new school was opened in southeast Hamilton County. It was named Hamilton Southeastern High School (HSE). The opening of this new school also included the redrawing of school boundaries in southeastern Hamilton County. These new boundaries included the town of Fishers. Therefore, Fishers High School was closed and the Fishers Tigers became the HSE Royals. HSE was a small school rural school and baseball was one of only a few sports offered. It has since become a school of nearly 3000 students, giving athletes the opportunity to participate in many activities. 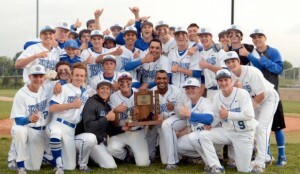 HSE BASEBALL – Over the years HSE Royals baseball has won 14 IHSAA Sectional Championships, 4 IHSAA Regional Championship, and 16 conference titles. There has been one player to play professionally – Doug Stis (1982 with Cincinnati and Montreal). 59 players have gone on to play at the collegiate level; 15 players have been Indiana All-Stars; and 12 Royals has received All-State honors. Since 1967 Royals baseball had some positive seasons and some outstanding individual players in its early years. But, the Royals baseball program took off in the 1978 season. The 1978 baseball team won the first IHSAA sectional of any sport that spring by winning the baseball sectional at Noblesville. This sectional included Carmel, HSE, Noblesville, Sheridan, Tipton and Westfield. HSE followed that sectional championship with two more in 1979 and 1980. In 1983 Royals won its fourth sectional championships be defeating Carmel in the Championship game. In 1988 a new level of success surfaced for HSE baseball. The Royals won the sectional and its first IHSAA Regional. In the IHSAA Semi-State in Richmond they won the morning game, but fell to Muncie Southside in the championship – ending the season with a 31-5 record. In 1990 another sectional was captured and HSE went to the final game of the regional. In 1993 the Royal made another run with sectional and regional championships. This time beating Andrean in the morning semi-state game but losing to Lafayette Harrison in the championship. In 1996 HSE won another sectional. In 1998 the IHSAA went to class sports. In baseball HSE was in the largest class and the tourney format changed. The 1998 Royals team had a great season, winning a sectional and regional. The semi-state was in Evansville and a championship there meant the winner was headed to Victory Field to play one game for the state championship. HSE came out on top of Terre Haute South in extra innings in game one, but fell to Jeffersonville in the championship – one game short. In 2002, 2003, and 2004 HSE again was IHSAA Sectionals. The 2004 team was another regional for HSE and it was off to the semi-state in Evansville. Another difficult loss for HSE when they fell to the eventual state champion in the semi-state game. The Royals ran into a dry spell until 2013 when it seems tournament success has returned by winning IHSAA Sectionals in 2013 and 2015. A STORIED TRADITION OF HSE BASEBALL CHAMPIONSHIPS!